The tips of the leaves of cedar, Thuja occidentalis, are useful in skin washes and baths to address skin problems like psoriasis and infectious skin diseases such as scabies. Thuja may also be used in hot compresses and steam baths to ease rheumatism, arthritis, and achy muscles. A tea made from the leaves is used as a stimulating expectorant that is useful for treating bronchitis, colds, and other respiratory problems, 1but is not the first choice on the herbalist's shelf because of possible toxic and allergic reactions. 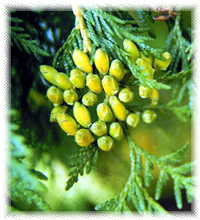 Thuja essential oil has an even greater concentration of thujone and many aromatherapists prefer to substitute juniper berry or cypress oil, which have similar benefits and properties, in skin care applications. Preparation Methods & Dosage :The leaves have an aromatic flavor and scent, and may be used with caution as a tea and skin wash.
Thuja oil has a camphoraceous, fruity aroma that gives a lift to the emotions and clears stale air when used in room diffusers. 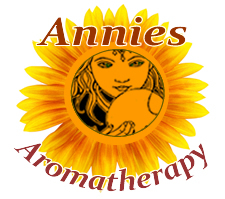 The oil has antibacterial and constricting properties when used externally on skin, and may be a skin irritant. Thuja oil should not be used in during pregnancy. Thuja Side Effects: Not to be used in pregnancy. The oil contains thujone, which has a high toxicity,so the herb should only be taken in small doses for short periods of time. Thuja should be used as prescribed by a qualified practitioner. Cones: overlapping, thin, leathery scales, each scale bearing 1 - 2 small seeds with a pair of narrow lateral wings. Distribution:North America, Eastern Asia. Thuja's common names white cedar, yellow cedar, cedar leaf oil, cause confusion because it is not a cedar, but a conifer member of the Cupressaceae or cypress family. Aromatic, astringent, diuretic. The decoction has been used in intermittent fevers, rheumatism, dropsy, coughs, scurvy, and as an emmenagogue. The leaves, made into an ointment with fat, are a helpful local application in rheumatism.